Heating, Ventilation and Air Conditioning Products | Air Conditioning | Heating | HVAC | Modesto, CA 95351 | Bailey's Heating & Air, Inc.
It’s well known that today’s energy efficiency and modern building advancements have come at the expense of indoor air quality, sealing and trapping pollution inside, then delivering it into rooms and offices through heating and cooling equipment duct work. To help combat these problems, activTek provides effective and convenient ways to treat the air being circulated by HVAC systems as it passes through the ducts and out in the indoor environment, taking the solution to the source. 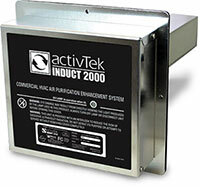 Built around ActivePure® technology, activTek’s INDUCT line of environmental conditioning products work to actively neutralize odors and reduce contaminants inside the duct as it is carried through the system and into living spaces. Areas as small as 500 square feet can be treated as effectively as 10,000 square feet by installing one of our properly sized INDUCT units. For greater square footages, multiple units can easily be used in the same installation. All activTek ActivePure® Technology products are tested to insure a level of performance and effectiveness for environmental conditioning. For more about ActivePure® products, click here. Complete Tankless Water Heater Selection – Noritz offers three lines of hot water heaters to support a wide variety of customer needs. Versatile Water Heater Installations – The compact design of the Noritz line of tankless hot water heaters gives you installation flexibility. Designed for placement indoors or outdoors, a Noritz unit saves space and can go almost anywhere. Installation Made Easy – Once trained, professionals may easily install a Noritz tankless water heater. Additionally, Noritz offers all the venting and accessories needed for the job. Benefit of gas vs. electric – Gas heats water 50% faster than electricity, yielding a higher flow rate and providing superb energy efficiency and utility savings. Quality and craftsmanship – Noritz owns all aspects of manufacturing, ensuring that you always get the highest quality parts. We are so confident in our craftsmanship that every unit comes with a Noritz 12-year non-prorated warranty. Better customer service – At Noritz, tankless water heaters is all we do. Noritz customer service representatives are all certified water heater specialists and available to assist you with any aspect of installation and service.